Members of The Second City perform Wednesday night at Alianza and SHPE'S 14th Annual Comedy Beatdown. The show also featured comedian Mark Viera. Comedians took the stage on campus Wednesday night at an event sponsored in honor of a late Northwestern student. The 14th annual Comedy Breakdown, sponsored by Alianza and the Society of Hispanic Professional Engineers, featured “30 Rock” actor and comedian Mark Viera and members of The Second City. The annual event honors former Alianza and SHPE member Marcus Marinho, a McCormick student who died in a car accident in the winter of 1997. Alianza co-president Carlos Martinez said the groups chose to host a comedy event to honor Marinho’s comedic personality. “Even though many of us board members never got the chance to meet Marinho, we are privileged to continue this legacy and pay our respects to the great person that he was,” said Martinez, a Medill junior. At the entrance to the show, which attracted about 80 NU students and alumni, members of Alianza and SHPE marked the letter “M” with a black sharpie on the hand of every attendee. As the show began, Martinez said that the “M” stood for Marcus and was a way to keep him in everyone’s hearts at the show. Alianza co-president Lucia Leon said before the show she hoped the event would give attendees a way to relax and enjoy themselves. 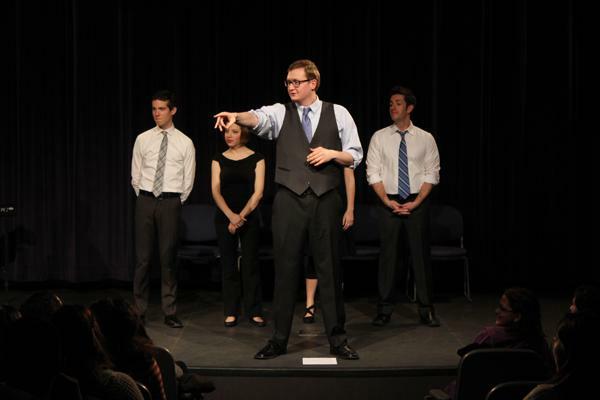 The first hour of the show consisted of a performance by a cast of Second City. They opened the performance with a series of improvised pieces. The Second City cast was followed by the presentation of a $250 scholarship to McCormick freshman Edgar Vazquez for his involvement with the SPHE. The night’s special guest was Viera from New York, who has appeared on the NBC show “30 Rock” and on “Martin Lawrence Presents 1st Amendment Stand Up.” He joked about women’s self-esteem and love for shoes as well as the short attention spans of 9-year-olds. He also discussed love and patience, as he joked about his wife for taking hours to get ready. He got serious when he addressed the importance of having self confidence. Alianza vice president Sobeida Peralta, a Weinberg sophomore, said the group aimed to make the event appeal to a wide audience. “We want to include the larger Northwestern community, not just the Latinos but anyone who wishes to learn, join and become a productive member of these organizations,” she said.